SIGNED Books. Always FREE SHIPPING! Ray McAllister, the Richmond Times-Dispatch‘s popular humor columnist, has found a funny and real world people by everyone from a good ol’ boy in New York to music superstar Michael Bolton to a three-year-old flower girl. Put your feet up and settle back for the laughs. “Ray writes about the people behind the scenes and behind the news. His columns lend depth and texture to the coverage of our region and this welcome collection will make for enjoyable interesting reading. “HERE IS A MARVEOLOUS collection of good reading from a member of the new generation of newspaper columnists. 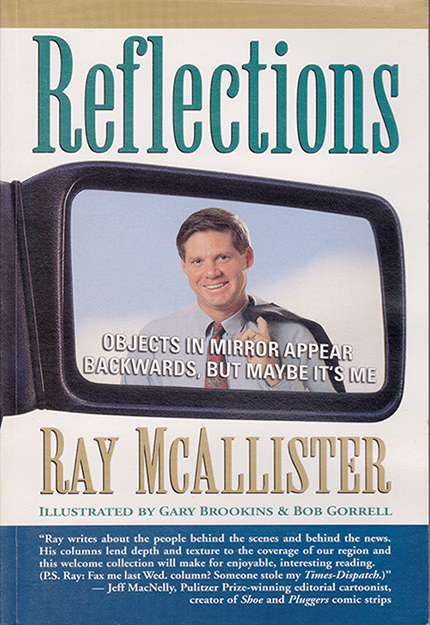 Ray McAllister is not hung up on old-fashioned essays or even semi-old-fashioned imaginary interviews with a neighbor named Art Buchwald. “McALLISTER WRITERS his side of of a kind of conversation with his readers. His subjects are politics, family, television, sports, grocery shopping, whatever. His mood can be funny, sad, instructive, whimsical, maybe mildly indignant, but never pretentious. “THE SENTENCES have a certain rhythm and they tend to be short, which is an engaging quality in sentences once you get use to it. His paragraphs can be so quick, one line after another, that you think you hear a lively tune.